A wood-burning Fireplace is a traditional fireplace which may, or may not, have glass doors. Chimney fires can occur when creosote builds up on the inside of the chimney flue. 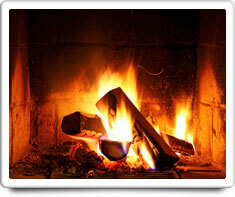 Creosote is a black or brown residue which comes from the smoke of burning logs in the fireplace. Creosote is highly flammable and, if allowed to build up, can catch fire and burn at temperatures approaching 2,500 degrees Fahrenheit. These temperatures can crack flue liners and allow heat to ignite nearby wood or other combustible materials. A wood-burning Fireplace is different than a gas Fireplace, which uses either natural gas or propane as the fuel source, and whose 'logs' are fake. CO Detectors, Fireplace (gas) and Wood Stove. Shown in the 'Routine Care' section are the recommended routine maintenance tasks for your fireplace (wood-burning). The 'Q & A' section shows answers to common questions. And the 'Articles' section provides helpful articles about your fireplace (wood-burning).